Are you ready for it to stop? It is no joke that dental anxiety and fear are leading causes of tooth decay and other dental issues. Imagine if you could schedule your dentist appointment being completely confident that you’ll be relaxed and comfortable during your visit! Releasing tension and anxiety allows you to relax through the treatment plan your doctor recommends, and allows for faster healing. Our body has an amazing innate ability to recover from illness and trauma, and good dental anxiety relief can help you get the most out of your treatment. Dental Anxiety/Fear/Phobia relief is a 3 session package. Some times issues that are outside of our conscious awareness can manifest themselves in our lives, in the form of negative or destructive behaviors. Teeth grinding (bruxism) is an issue that continues to baffle dental professionals around the world, and although night guards and other tools can minimize its impact on our body, the best policy is to clear the source of the issue(s) and build a new set of skills so that we’re better equipped to deal with other similar situations. Our bruxism protocol is a set of 4 sessions, designed to work together to eliminate grinding and clenching. This process will help you release those unconscious triggers that make you grind and help you maintain a healthy balance in life. Brux-away is a 4 session commitment (to be done within 4-6 weeks). Your investment is far less than the costly damage or clenching and grinding. Temporal Mandibular Joint Disfunction is the result of clenching and grinding your teeth for a prolonged period of time. Bruxing causes the muscles around the TMJ to get more exercise than they need, and the disfunction shows up in the form of pain and lack of mobility. The human brain has the amazing ability to control how we respond to signals such as pain and stress. During your TMJD/Pain relief sessions we will create new associations that take the suffering out of pain and allow for proper healing. Working with TMJD and/or other long-term-pain issues starts with a 4 session package. Stop smoking with no cravings or weight gain! Do you have a habit that you’d like to change? There are generally 2 ways to get rid of a bad habit: Replacing a bad habit with a different one, and or deciding that you’re fed up with it enough. It’s what happens when the benefits of NOT having the bad habit outweigh the “pleasure” the bad habit gives us. Hypnosis is an incredible tool to help you make the changes you desire, and habit control for things such as smoking, nail biting and overeating is one of the main things the modality is known for. It’s amazing to me every time our clients let go of habits and behaviors that were holding them back. It truly shows that some things that may seem impossible to our conscious mind are handled so well by the real decision maker, our unconscious. Stop Smoking is a 3 session protocol, and it saves you lots of money over a year’s time as a non-smoker! Other habits are 2 sessions minimum. Book your free consultation today and let us assist you to break through the barriers of unwanted habits. The interesting thing is that re-training your mind to respond differently to the things that used to make you gag, is a fairly simple process. Gag reflex training consists of a minimum of two sessions. Taking a “pain killer” activates reactions in the brain that release our natural “feel good chemicals”. Those same reactions can be activated by utilizing the tools of effective communications such as hypnosis and neuro-linguistic programing (NLP). The human brain has phenomenal capabilities and it uses pain as an alarm system. Once we discover what is causing the alarm to go off, we can reprogram the way the brain reacts to it, and you can easily achieve stress and pain relief. Pain and stress relief starts as a 3 sessions package. The human brain has the amazing ability to control how we respond to signals such as pain and stress. During your long-term-pain relief sessions we will create new associations that take the suffering out of pain and allow for proper healing and enhanced quality of life. Chronic, intractable, and other long-term pain issues start with a 4 session commitment. Do you dream of an entire night of restful, rejuvenating sleep as you toss and turn, battling insomnia? Many times our sleep cycle goes out of sync with the rest of our hectic lives, in this insomniac day and age. Other times there are outside factors that keep us awake at night, such as stress and pain. Regardless of the reasons, sleep deprivation can translate into a range of problems in other areas of life. From health issues to a poor social schedule, sleep deprivation causes irritability, lack of energy and reduced cognitive ability. During your Hypnodontist session to overcome insomnia, We will work with you to relieve the stress that may be causing it and to identify and realign whatever has taken you out of sync. Our sleep deprivation / insomnia program starts with 3 sessions. 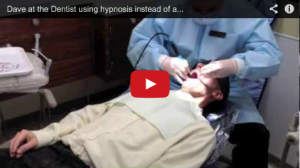 Hypnodontics is a professional hypnosis specialty, dedicated to the control and/or elimination of subconscious behaviors that keep people from achieving optimal dental health. Hypnosis is a naturally occurring phenomenon that can be self-directed or guided by another person (a hypnotist or Hypnodontist). It creates a state of focused concentration that can make change seem effortless and automatic, with the proper motivation. A Hypnodontist™ is a certified hypnotherapist who has chosen to follow a set of high standards, through continuing education and presentation protocols, and is thereby well qualified to work with medical and dental professionals and their patients. 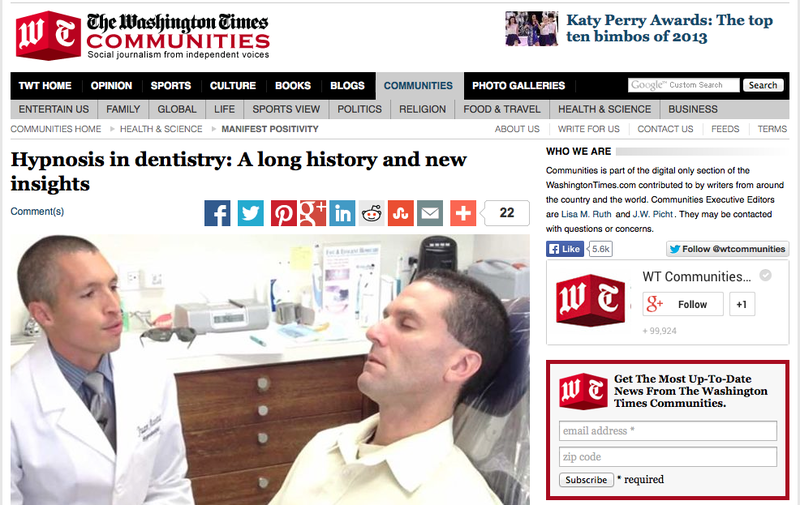 Other dental professionals have designations such as Endodontist, Orthodontist, etc, depending on their specialty. A Hypnodontist is a mind/body connection dental specialist. 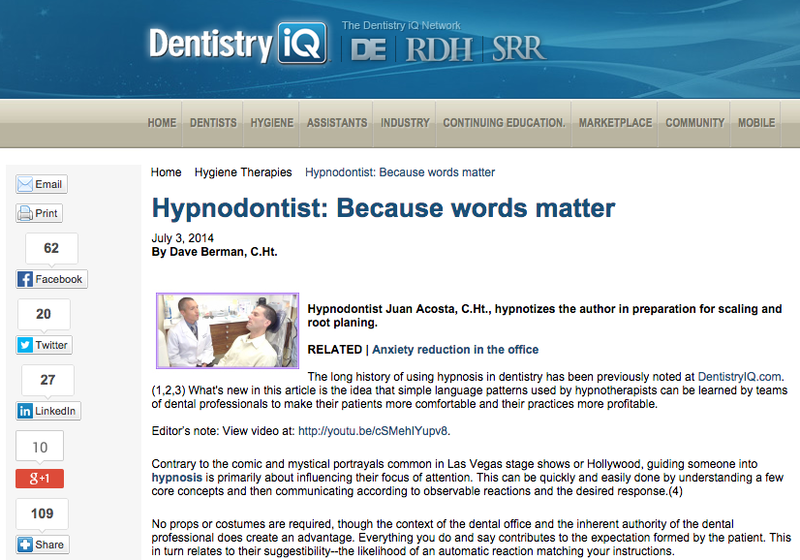 Hypnodontist.com is a resource for dental and hypnosis professionals who want to learn how to better communicate with dental patients, to make oral health a priority. 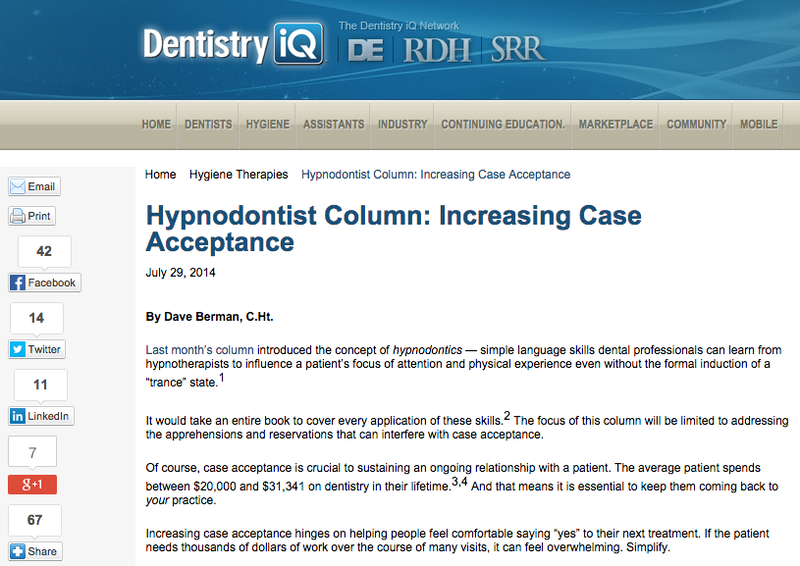 It is also where dental patients can find information and contact me for hypnotherapy services. 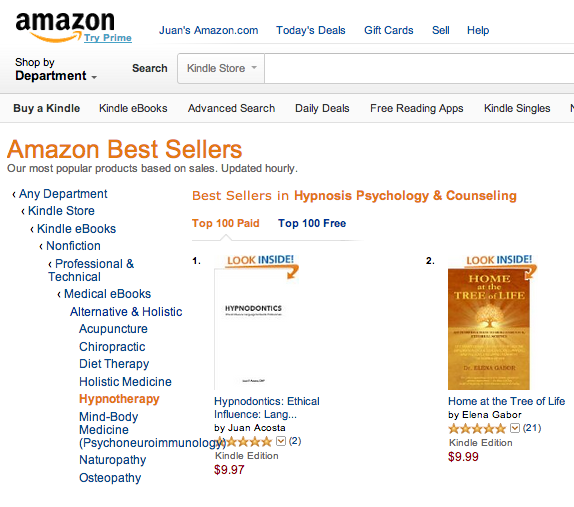 Check this link to see how you can learn Hypnodontics little by little for less than $10/mo. Not a chance. Since hypnosis occurs naturally, it’s simply a sense of internal awareness much like a daydream. You can bring yourself back to your normal awareness any time by focusing your attention on something else. Much like snapping out of that daydream. What if I'm not hypnotizable? Some people still ask this question so I decided to answer it a little different. I will assume you’re sitting down as you read this, so just imagine you’re seeing a dear childhood friend and hearing his/her voice. Remember one thing that you enjoy about this person’s memory and let it fill you up as you breath in deeply. Now think about what just happened and answer this: Did you experience even a small emotional change as you brought back that childhood memory for a few seconds? Ok. Hypnosis is about evoking the emotions that create the changes you want. In that sense, we’re all hypnotizable. So, are you a doctor? No. I provide complementary care that many doctors like to offer their patients, but I’m not a doctor, nor do I play one on TV. I’m trained in hypnosis, neuro-linguistic programing (NLP), and other modalities, and hold a diplomate certificate from the International Certification Board of Clinical Hypnotherapy (ICBCH), as well as a CHP from the Hypnosis Practitioner Training Institute (HPTI). That depends on what it is that had made you uncomfortable in the first place. Most people are able to relax once they understand how natural and gentle the process is. Unfortunately the image the general public has, is of the entertainer hypnotist, performing some amazing feats with a stage full of volunteers. Which by the way, is actually lots of fun and how I started in hypnosis (LOOK) – Anyway… we’re using the same tools in different ways, and at working with me is a nice, relaxing and comfortable trip into your inner resources. Nothing to be scared of. If you have a specific fear/apprehension you’d like to discuss please give me a call so I can better assist you. Clenching and Grinding many times show up as a response to internal conflicts, things that are out of balance in life, and situations that even if unconsciously, make us worry. When you go through the Brux-away program with me your mind will be better equipped for dealing with certain situations that might have derailed you before, and you will have released all those triggers that used to make you clench. Your jaw muscles will thank you, your teeth will thank you, and your dentist will thank you. That is a fantastic investment for your oral health! Not at all. In fact in many cases we don’t even do any eyes-closed processes… but if we do, you’ll simply be in a state of comfortable relaxation and hearing every single thing I say. Your senses will be heightened and your awareness enhanced. It’s truly enjoyable! while I worked with her patient.